Residents of southern Pierce County are blessed to have Edwin Ravina, one of the masters of the venerable art of Tai Chi, offering classes in our area. Master Edwin describes Tai Chi as being an integral part of the well-known martial art form known as Kung Fu, but for the un-initiated Tai Chi might be best explained as a seemingly slow-motion form of a martial arts exercise that is self-defensive in nature. 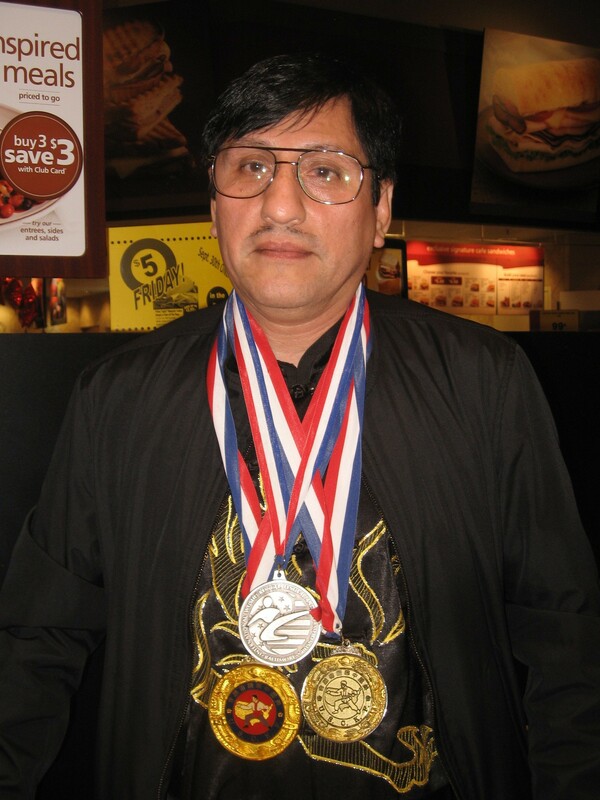 Tai Chi Master Edwin Ravina, wearing some of the medals he has won in international competitions. “Kung Fu is Tai Chi, and Tai Chi is Kung Fu,” Master Edwin told me, with both disciplines being a martial arts form but Kung Fu being the “hitting” aspect or the externalized force of the practice, whereas Tai Chi is more of the internal force – the physical expression of Qigong, pronounced Chi Gung, the centering and spiritual energy of nature. 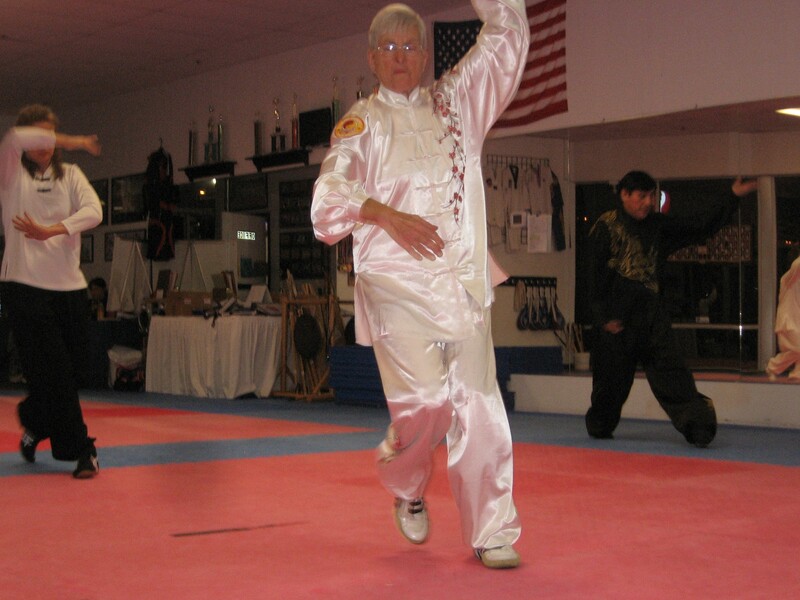 “Kung Fu is the foundation for Tai Chi,” said Edwin, “but the final step of Tai Chi is Kung Fu. Master Edwin and his chief assistant Cele Noble spoke with the Mountain News over coffee at the Graham Starbucks, and they described the power and benefits of Tai Chi along with the remarkable journey Mr. Ravina has undertaken to learn his craft and then find his way to this land in the Shadow of the Mountain. Edwin was born in Peru and had a challenging childhood. His mother died when he was two years old and he was raised by a Japanese-Peruvian woman named Nakayama. She instilled an appreciation of Asian culture, including Tai Chi, but Edwin’s interests were more focused on sports, especially wrestling. By sixteen, Edwin was the wrestling champion of Peru, and over the next few years he represented his country in several international competitions. However, during his teenage years Edwin’s interests in the martial arts also grew. At the same time, Tai Chi was also undergoing a profound transformation, and the traditional forms of the discipline were being suppressed by the Cultural Revolution of the Maoist regime in Communist China. As a result, masters of the ancient arts had to escape mainland China and seek refuge throughout the world, with several teachers finding a new home in South America, including Peru. Then, in 1975 at the age of thirteen, Edwin found a teacher of the ancient form, Chang YemBo, whose grandfather had brought the art to Peru when he fled Mao. 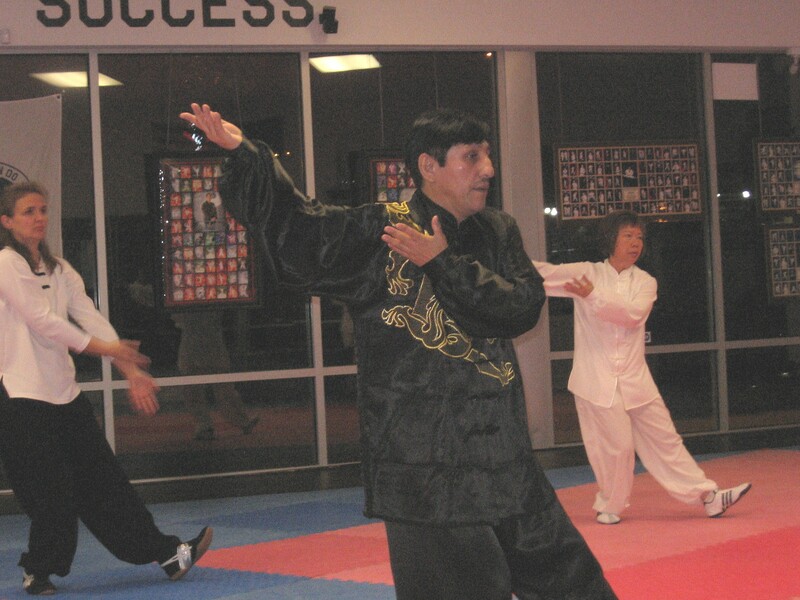 With Chang YemBo, also known by his Peruvian name, Juan Benites LaRosa, Edwin mastered the traditional form of Tai Chi, known as Kuoshu Tai Chi. Since then, Chang YemBo has remained a life-long mentor to Edwin. Edwin's master class at the Graham UTA. With Edwin are Cele Noble, left, Annette Smith, center, and Tammy Becker, right. During his studies in Peru, Edwin developed several aspects of his Tai Chi. 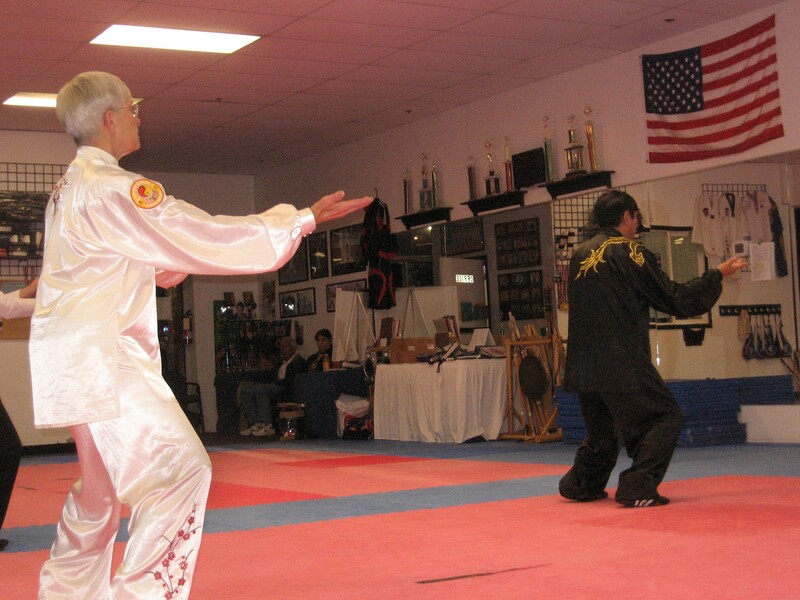 One was mastery of the competitive forms of Tai Chi, and by the end of the 1990s Edwin won several awards in international competition, earning silver and gold medals in 1999 during the International Kuoshu Championship Tournament held in theUnited States. In addition, Edwin was also perfecting his practitioner’s skills in the healing aspects of Tai Chi. Utilizing Tai Chi’s ability to move or store energy – the Qigong – Edwin developed a clinical practice in seventeen remote rural regions of Peru, specializing in helping elderly patients. Edwin says that the traditional form of Tai Chi is particularly adept in restoring physical vitality. The coordinated breathing – the direct, concise pushing of breath in and out, and directing it to various parts of our body that need invigoration, coupled with physical movements that accent or enhance those energetic intentions – gives Kuoshu Tai Chi powerful medicinal properties. “Tai Chi makes energy,” says Edwin, and he describes a process whereby the breathing and mental focus of Kuoshu Tai Chi forms a dynamic pressure – almost like a needle that would be used in the healing art of acupuncture, an acupressure if you will – that stimulates and heals the body. Although Edwin has been living in the United States since 1999, he still continues to travel the world for competitions. In addition, Edwin returned to Peru this past August to celebrate the 36th Anniversary of Chang YemBo’s Martial Arts Academy. In fact, Edwin received his 7th Degree Black Belt from Chang YemBo on this last visit. Edwin has also journeyed to China and his last visit was during the summer of 2010, when he completed specialized certification in Clinical Scalp Acupuncture and Clinical Medical Qigong, studies that he continues in the United States. Nowadays, Edwin calls South Hill home, but he also spends lots of time on the Graham horse ranch of Cele and Tony Noble. Cele Noble displays her enhanced agility gained after three years of Tai Chi with Master Edwin. Nevertheless, his teaching schedule is active, and many opportunities exist to practice Tai Chi with this master. 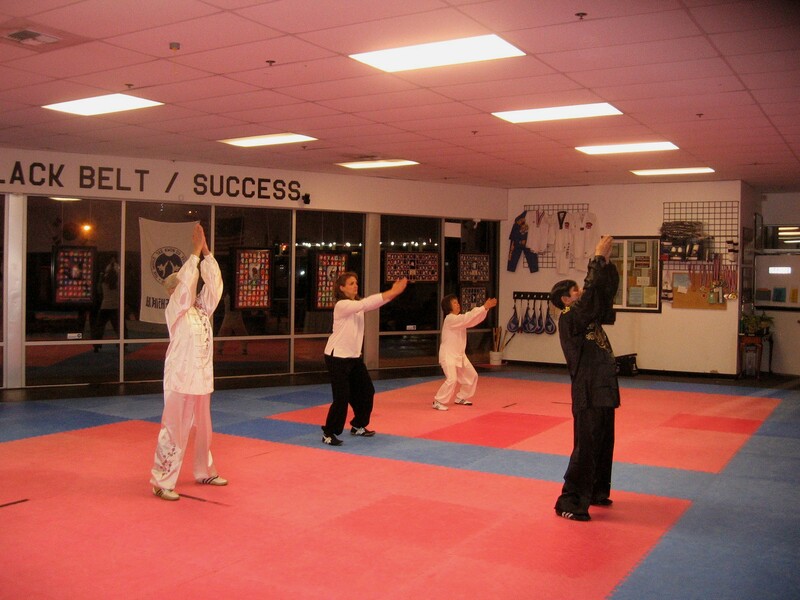 Class members possess a mixture of abilities, and beginners are warmly invited to sessions. However, there are some advanced classes that require the stamina and flexibility that only comes with years of disciplined practice, such as the Monday night class at the UTA center in Graham. Frequent classes are found at the Mel Korum YMCA in South Hill, LA Fitness in Puyallup and in Redondo Beach north of Tacoma. The advanced class at the UTA meets Monday at 8 pm, Tuesday at 7 pm, and on Saturdays at 8 am. In Eatonville, there is a single session at the Community Center on Thursdays at 5:15 pm. Also, there are periodic sessions in Graham for beginners at Frontier Junior High under the auspices of the Graham-Kapowsin Community Council. For more information, contact Cele at (253) 847-6299, or noblelipizzans@gmail.com. In addition, several videos of Master Edwin plying his art can be found on YouTube, and other information can be found at www.taichiqigong-ravina.webs.com . Since Edwin has an international following, he also can be reached through Facebook. This entry was posted in Culture, People Profiles. Bookmark the permalink. The kung fu is an ancient Chinese martial art, has more than 5,000 years old and badly taught his teachings go against life and discipline of the spirit, the very wise masters have indeed been transmitted his teachings generation to generation, not just the traditional Chinese martial arts, also the traditional Chinese medicine and chi kung, or the internal energy transmitted by the master Edwin Ravinay thus succeeds in changing the quality of life of people, I am very pleased with the master, to convey their deep knowledge, my best wishes to you master Edwin Ravina. Grand Master Chang Yem Bo. I am a new student of Edwin Ravina at the South Hill YMCA and for such an accomplished person he is amazingly patient and encouraging to his beginner students. I started Tai Chi at the request of one of my physicians. Edwin was well recommended to me but, until I read this article, I had no idea of all his international honors in this field. My balance has already improved after only a few weeks of lessons and I very much enjoy and look forward to his Wednesday and Friday classes for beginners. I plan to continue for years hopefully, as Tai Chi is a constantly elvolving activity and is very challenging. Thank you for sharing such a heart-felt experience with Tai Chi, Sue. And congratulations on your improved health! Between this and a mixture of Yoga and lots of walking/running, as well as eating healthier, I have taken care of most of my anxiety/panic problems that a multitude of different medications were not able to help with. I have been taking Tai Chi with Master Edwin about a year now and I have noticed a big improvement in my balance and my breathing. Years ago I had a head injury in a car accident and since than I have had a challenge with my balance. I couldn’t even begain to stand on one foot. I had times when I would fall and I had dizzy spells. Since I have been involved with this class I can stand on one foot move my body with more smoothness and I have quit falling. My breating used to be shallow and the movements we do with breathing have imporved my breathing which gives me more energy and overall makes me feel better. I am so greatful that I have found something that works for me. Margaret. Congratulations, Margaret, and thanks for telling us about your transformation. I have also been a member of Edwin’s class for three years at Puyallup YMCA. It has helped me in so many different ways, such as balance, breathing correctly, patience and it is a joy to have Master Edwin guiding us. He is a wonderful person and I count him as a good friend. It is comforting to see that the traditional Chinese arts were taught me by my ancestors, especially having to do with human health is taught and disseminated in the world, are just a few strands in the fabric which will not see the future, go ahead good student, now teacher Edwin Ravina.